IQD has been presented with the ‘Top International Distributor & Partner’ Award by Statek Corporation for the second year in succession. 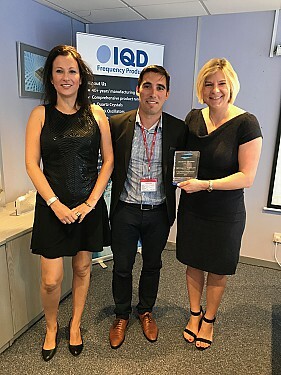 The award was presented to IQD’s Director of European Sales, Anke Allen and Business Development Manager, Sara Bradley by Flavien Heurtier of Statek. Commenting upon the award, IQD’s Group Managing Director, Paul Fear said “Our strong partnership with Statek allows us to provide unique solutions for many of our customer’s more challenging projects. This award reflects the hard work and dedication of all the team at IQD as well as the excellent support service from Statek and we fully expect this business to continue to grow”. IQD is a global authorised distributor for Statek Corporation’s highly specialised photolithographic process based quartz crystals, oscillators and sensors that offer very high environmental performance and are particularly suitable for medical, military, avionic and ‘down-hole’ applications.